New Jersey ASID 2017 Design Excellence Award winners were: front row, from left: Nancee Brown, ASID, of Summit; Beth Insabella Walsh, ASID, of Little Silver; Ivee Fromkin, Allied ASID, of Monmouth Beach; Anna Maria Mannarino, Allied ASID, of Holmdel, chapter president. Second row: Hong Jin, ASID, of Mountainside; Suzan Lucas Santiago, ASID, of Lake Hiawatha ; Ria Gulian, ASID, of Oceanport. Third row: Sharon Sherman, ASID, of Wyckoff; Marina Klima Goldberg, Allied ASID, of Morganville. Fourth row: Maria Bevill, Associate ASID, of Chester; Tracey Stephens, Allied ASID, of Montclair; Sheila Rich, Allied ASID, of Monmouth Beach, who won two golds, two silvers and one bronze. Back row: Jo Ann Alston, Allied ASID, of Far Hills; Virginia Zonfrilli, Allied ASID, of South Orange. Not pictured: Diane Durocher, ASID, of Ramsey; Karen Topjian, ASID, of Englewood; Karla Trincanello, Allied ASID, of Florham Park; and Linda Wagner, ASID, of Wall. The New Jersey chapter of the American Society of Interior Designers presented its 2017 Design Excellence Award winners during its gala at the Shadowbrook in Shrewsbury, N.J. on June 14. In all, 18 chapter interior designers won a total of 30 prizes among them. For the Chapter's Design Excellence Awards, designers could submit projects in residential and commercial/non-residential sectors. The residential sector had 11 categories in which designs could be entered, from a single space to a historic preservation project. On the commercial/non-residential side, the seven categories included everything from a retail/showroom/exhibit space to government/institutional space(s). All entries had to have used at least one Industry Partner at the time of the project to be submitted. "Successful entries demonstrated exceptional design and positive impact on life and the human experience in keeping with ASID's mission," said Anna Maria Mannarino, Allied ASID, president of the New Jersey Chapter. "The Design Excellence awards reinforce the ASID commitment to important design principles." Judges were comprised of a diverse group of award-winning ASID members from around the country and judging was based on the following criteria with a points system: Effectiveness of the design solution, functional use of space, scale and proportion, color and composition, innovative use of materials, creativity of the design solution, effective use of lighting, use of sustainable design principles and use of Universal Design principles. 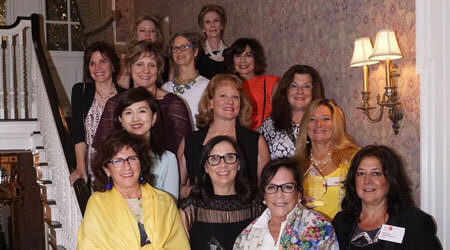 Award winners were: Nancee Brown, ASID, of Summit; Beth Insabella Walsh, ASID, of Little Silver; Ivee Fromkin, Allied ASID, of Monmouth Beach; Anna Maria Mannarino, Allied ASID, of Holmdel, chapter president; Hong Jin, ASID, of Mountainside; Suzan Lucas Santiago, ASID, of Lake Hiawatha ; Ria Gulian, ASID, of Oceanport; Sharon Sherman, ASID, of Wyckoff; Marina Klima Goldberg, Allied ASID, of Morganville; Maria Bevill, Associate ASID, of Chester; Tracey Stephens, Allied ASID, of Montclair; Sheila Rich, Allied ASID, of Monmouth Beach, who won two golds, two silvers and one bronze; Jo Ann Alston, Allied ASID, of Far Hills; Virginia Zonfrilli, Allied ASID, of South Orange; Diane Durocher, ASID, of Ramsey; Karen Topjian, ASID, of Englewood; Karla Trincanello, Allied ASID, of Florham Park; and Linda Wagner, ASID, of Wall.